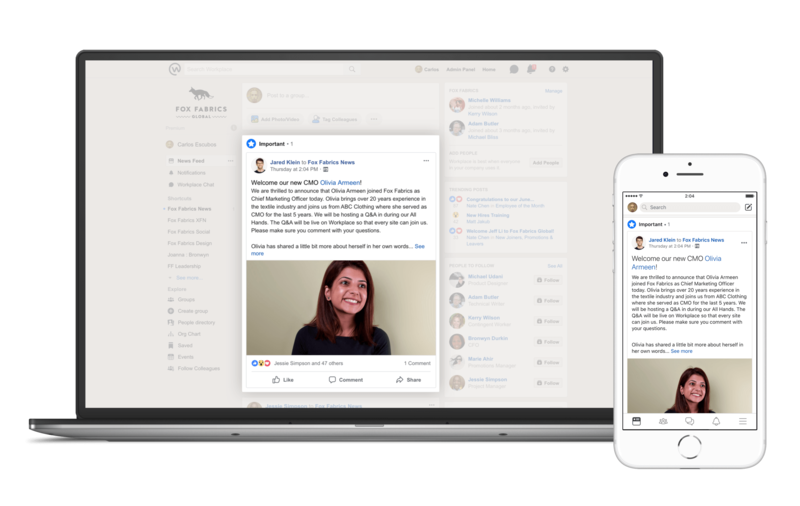 In early October I attended the first ever Workplace by Facebook conference, Flow. Flow was unlike any tech conference I’ve been to in the past - mainly due to the fact that it wasn’t a tech conference! Yes, it’s Facebook, yes it’s Silicon Valley - but this was something different. At Flow, we got to hear from business leaders about the truly transformational impact Workplace was having on the way that their organisations were getting work done. At Flow, we saw networking and engagement amongst attendees at a level that I have never seen at any conference, tech or otherwise. Completely unscripted, I ended up sitting in what we affectionately called the Aussie corner, next to an Australian Workplace customer, an Aussie journalist who was covering the event and our good friend Cai from Swoop Analytics. We were amongst approximately 350 very engaged attendees which was a good mix of existing Workplace customers, prospective customers, partners and the Facebook team which included Facebook COO, Sheryl Sandberg. There were several highlights to the day, from new product announcements (more of them below), to amazing customer stories, to my personal favourite, being mentioned by Workplace VP Julien Codorniou as one of people who was crazy enough to quit my job and start Enablo, a pure-play Workplace partner in Australia, when there wasn’t even a Workplace employee on the ground in Australia! Hearing this, along with seeing logos from three of our customers (NAB, Vodafone and Bunnings) on the list of recently launched Workplace customers made me exceptionally proud of what the team here at Enablo are doing and how we are having a demonstrable positive impact on the day to day working life of hundreds of thousands of Australian and New Zealand employees. Making work communities better prepared in a crisis by allowing employers to locate their people and provide assistance quickly. In 2014, Facebook launched Safety Check, a simple and easy way to let friends and family know you’re safe in a crisis, and check on others in the affected area. In the last four years, millions of people have used Safety Check to provide peace of mind to loved ones. 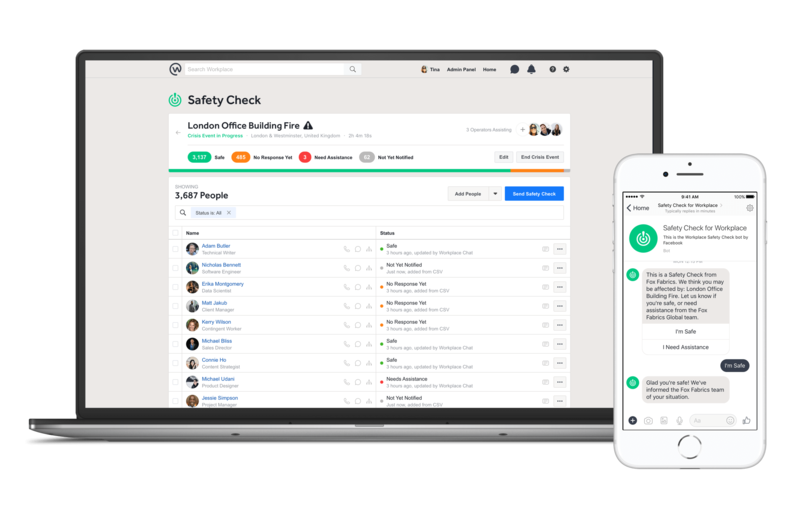 Safety Check for Workplace is a mobile-first way for organisations to find and help their people in a crisis. Because organisations are stronger when they’re connected, especially in times of crisis. Customers highlighted that the current tools for managing crisis response at scale are too slow and cumbersome for the modern work environment. With Safety Check, if a crisis arises, organisations can identify who may be affected, send multiple modes of notification, and monitor employee responses. And they can do it fast. We never hope for a crisis. But we’re committed to making Workplace communities more connected and resilient when they need each other most. Safety Check for Workplace will be available in early 2019. Turn off notifications in Workplace and Workplace Chat to let colleagues know when you’re not available. Workplace believes in connecting employees to work together and build communities. But they've also heard feedback from customers that there are times when working most effectively means switching off other distractions and focussing on tasks without interruption. You can now activate your Do Not Disturb status in Workplace and Workplace Chat. Simply turn off notifications across mobile and desktop at the touch of a button to maintain your Flow, finish that slide, or just take a break. You can decide how long you’d like to remain undisturbed and Workplace will let your colleagues know when you’ll next be available. Make sure high-signal posts reach their intended audience with new notifications and engagement metrics. As organisations grow, it becomes more difficult to make sure everyone has access to important updates and announcements. We’ve heard time and again from senior executives that they’re struggling to make high-signal comms cut through the noise. And it’s not for lack of trying. It’s estimated that over 280 billion emails will be sent this year, while executives spend an average of nearly 23 hours a week in meetings. But if information is the lifeblood of a business, we’ve reached the stage where the arteries are clogged and the circulatory system is failing. 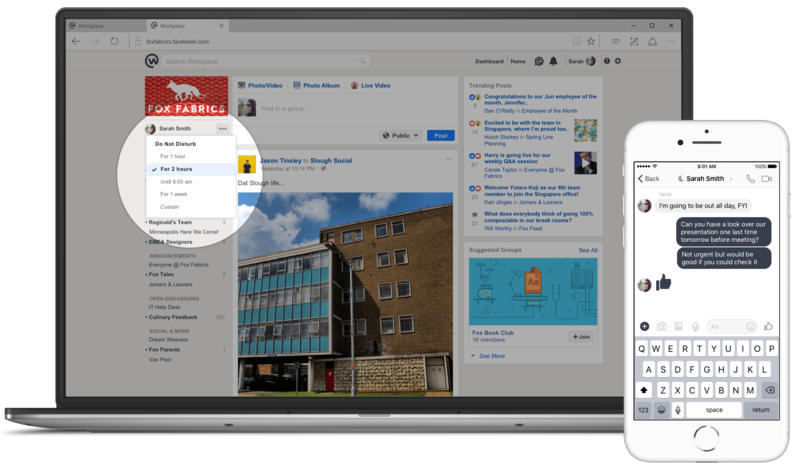 With the Mark as Important feature, group posts can now be marked as important when their message is high signal. These posts will show up at the top of the News Feed for every member of the group. Workplace will also send email and push notifications, and deliver a simple report to show the post’s engagement metrics. Instant messaging and video conferencing to connect with people outside your organisation. For many of our customers, enabling great teamwork isn’t just about supporting collaboration between their own employees. Being able to communicate and get work done efficiently with partners, vendors, suppliers, or agencies outside of their organisation is just as important. This collaboration is already enabled through multi-company groups. Workplace are now starting to roll out the ability for people who are in multi-company groups to work together using Workplace Chat. Following on from Flow, Workplace hosted Transform customer events in Sydney and Melbourne where Chief Workplace Officers shared their insights and learnings on their Workplace journeys. For those who haven’t attended Transform in the past, these events are focused on developing a thriving Workplace community. In Sydney we were hosted by Hoyts at their cinemas in Broadway with presentations by Vodafone, Hoyts and Taronga Conservation Society Australia. We (at Enablo) are pleased to say that we have worked closely with both Vodafone and Hoyts on their successful Workplace launches. Melbourne Transform featured presentations by NBN, NAB (both Enablo customers) and Reece. We look forward to seeing the Workplace community continue to grow and thrive at future Transform events.